Steeple View Ranch LLC, raises Murray Grey cattle on our ranch located in the scenic Kettle Moraine area in Southeast Wisconsin. The Kettle Moraine landscape was formed 10,000 years ago by glacier. Towering above Steeple View Ranch is the beautiful Holy Hill Basilica church. We have a closed herd of Murray Grey Beef Cattle with an emphasis on Australian grass fed genetics for tenderness and performance on grass. 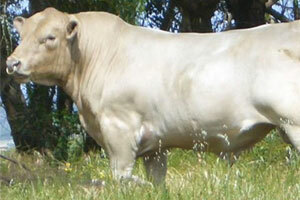 The Murray Grey Beef Cattle breed originated in Australia from a breeding of a Shorthorn female to an Angus Bull. Murray Greys have a heavy concentration of Angus DNA but have many unique characteristics that give a profitable advantage to commercial herds. Our original cow herd was purchased from Eagle Run Ranch in California. Eagle Run was one of the most influential breeders in North America. The cows we purchased represented their six top performing cow families enabling us to carry on their successful breeding program here in the midwest. We are primarily a seed stock producer but do have grass finished beef for sale on animals not selected for our breeding program. If you are interested in our Murray Grey breeding animals or our grass fed beef please feel free to contact us or schedule a visit. Steeple View Ranch is a producer of top performing grass finished Murray Greys using grass fed genetics from Australia, New Zealand, United States and Canada. We use an extensive AI and Embryo program focusing on maternal traits, moderate size, tenderness, longevity and performance on grass. Steeple View’s Murray Greys will improve your commercial grass finished herd. The American Beef Industry is in the midst of numerous adverse challenges. The survival of the U.S. producer and feeder operations is dependent upon efficiency. Unless an operator is selling the maximum amount of quality product in an efficient manner, operating costs, regulations and volatile markets can easily devour profit margins or leave them very slim. U.S. cattle producers over the past few decades have prioritized hypothetical expectations in selecting seed stock over the fundamentals of actual performance in developing efficient cattle. In my lifetime of being associated with the cattle industry, I have witnessed many quality herds deteriorate from selecting seed stock based strictly on EPD’s regardless of proper conformation. Many cattle producers have intertwined exotic breeds into the industry. As a result, the consistency in quality of beef marketed to the consumer varies drastically. Cattlemen in Australia have developed a breed of cattle that has all the qualities that fits the needs for a viable and competitive U.S. raised beef product. They have done so by selecting the best of the foundational English genetics. The Australians began the phenomenal Murray Grey breed by crossing the best of the original Aberdeen Angus with the best of the Shorthorn breed. The Murray Grey’s subsequent progression and development has led to an unique Angus Breed with a dash of Shorthorn influence.